This month, Fortune magazine published its listing of the 100 best American companies to work for. Unless you count a supplier of medical equipment, Gore-Tex products and two pharmaceutical companies, there were no manufacturing companies on the list. The likes of GM, GE, Boeing and United Technologies were absent from the list of best American companies to work for. The list seemed to infer that Americans wanted the softest, least demanding jobs where the personal perks were best. Is this really what Americans want in their work place? Soft, cushy jobs with nice personal perks? What about attributes such as challenging jobs with challenging goals? And difficult work environments that are rewarded when goals are met? Is Fortune’s list merely what elites think? Fortune used Great Place to Work to compile the survey. But who is Great Place to Work? And what do they believe? Their web site says a company’s culture is critical to its success. But that’s merely a view from HR. A soft culture, with cushy jobs is critical to success? That’s not how to define success in manufacturing, where there are few cushy jobs, the work place may be somewhat dirty and demanding, and the demands for meeting cost and other objectives are hard to achieve. 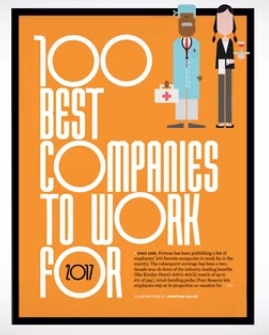 Fortune’s “100 best American companies to work for” listing seems to be self serving, especially for their partner, Great Place to Work. Fortune’s priorities don’t match what American manufacturing companies need to do, to compete in the world market. Perhaps, a little old-fashioned roll-up-our-sleeves and meet the challenge is in order. Manufacturing jobs may not be cushy, but they afford a real challenge for real Americans. With a little less soft, HR elite thinking, maybe we can meet the challenge. The article Another CO2 Sequestration Proposal should be considered a part of this book. 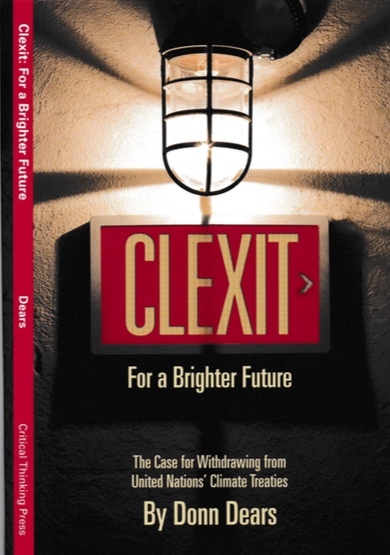 Clexit is really an appendage to Nothing To Fear. Wow. If this is what working people in this country expect and want (but I don’t think so) then this country is done for. Personally I’m a heavy truck/refuse truck mechanic and I get (at times) beyond filthy. I feel very rewarded by putting out a quality, safe piece of work that does its job. And if I can improve the truck along the way, so much the better. Good for you. And thanks for doing the tough jobs. This is a little different from you. Good info. Do you read the Pew Reports? Donn, I am with you and agree. Could be our Generation who worked our way up to a comfortable retirement by studying, working hard, working long hours, traveling extensively Domestically as well as overseas and taking risks. I worked as a field service engineer most of my life specializing on coal combustion in coal fired power plants. A very rewarding career of meeting many challenges and interesting people. My world was not the “Touchy Feely” working environment of today. I share your concern for America’s future if entitled and easy is the way the next Generation wants their lives to be. As a 74 year old my fondest memories (now) are looking back at the rewards of taking tough jobs and working through them. I can’t imagine a young person having the same satisfaction without risk, pain and difficulties. Adversity brings the best out in us. By the way, I have been reading your new book. You have inserted great facts and reminders of the foolish and stupid policies our government has committed to with the UN. Hopefully President Trump will undo these dumb and anti-American agreements. Thanks for your comments. I agree, and wrote that article because of the same concerns. Do our children and grandchildren have what it takes to succeed? Do they have the education and do they have the internal fortitude to take on challenging and rewarding jobs. Thanks also for your comment about my book.